One evening in March 2010, I sat down to write what became Chapter 3 of “Immortal Link.” It was like an urge to get the true story of a young girl who was raped in her bedroom by one of her brothers’ friends out in the open. I only knew that it happened and that the siblings never told anyone about it. Years later, the mother found out from a counselor, who said that the act of keeping such a traumatic event secret and to take care of their younger sister was superhuman. Once the chapter was written I started thinking about a setting. The next evening I watched a documentary about the town of Jim Thorpe, PA and its Old Jail museum. When I heard about the famous handprint in cell# 17, I took notes. Further research got me hooked on the location and its incredible history. I had my setting. Since it was only a two-hour drive away, I went to visit to see it for myself. That’s when something crazy happened: The setting took over and completely changed the direction of my novel. Trusting the spirits of the Old Jail, I followed their leads which I discovered through research and oral stories. All I had to do was to write it down. When the first draft was finished, I knew I had a story so rich and incredible that I couldn’t have done it alone. 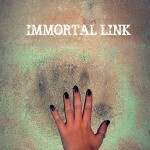 I am sure you will be as surprised as I was while reading “Immortal Link.” Let me know what you think. You can reach me at utaburke@gmail.com.